Abbotsford – The Abbotsford Bloom Tulip Festival starts April 15 with tickets available on line. They offer group rates for 20 or more people Monday – Friday but not on weekends due to the expected crowds. Peter Warmerdam and his family immigrated from the Netherlands and settled in the Fraser Valley in 1950. Peter proudly brought his Dutch heritage, horticultural knowledge and farming experience to the Bradner area – here he would grow a few acres of daffodil flowers. In 1974, Peter purchased land in Abbotsford’s Sumas Prairie, where he began growing gladiolus. Not long after, the family farm expanded their crops to include outdoor tulips, daffodils, and peonies along with greenhouse tulips and daffodils. Peter’s passion for all things flowers was one that the entire Warmerdam family shared. So it wasn’t much of a surprise when Alexis, Peter’s granddaughter, came up with the idea for the Bloom Tulip Festival – so locals and tourists alike could stroll through our tulip fields and enjoy the breathtaking display of color, along with other eye-catching activities in the field. 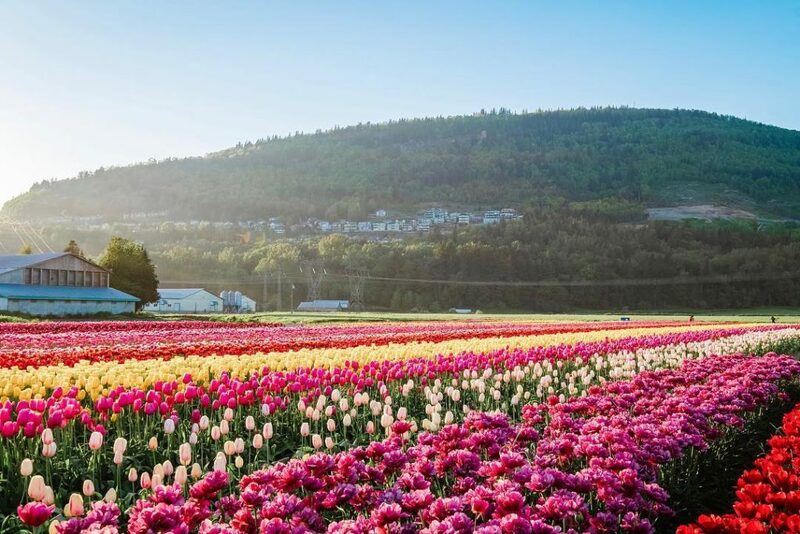 Be the first to comment on "Abbotsford Tulip Festival Opens Monday April 15 –"